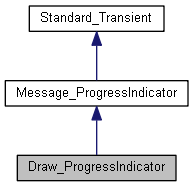 Implements ProgressIndicator (interface provided by Message) for DRAW, with possibility to output to TCL window and/or trace file. Creates a progress indicator and remembers pointer to Draw_Interpretor. theUpdateThreshold defines minimal progress (in percents) between updates of the indicator (non-forced updates of the progress bar will be disabled until that progress is reached since last update). Get/Set default values for output modes. Clears/erases opened TCL windows if any and sets myBreak to False. Defines method Show of Progress Indicator. Internal method for implementation of UserBreak mechanism; note that it uses static variable and thus not thread-safe! Redefines method UserBreak of Progress Indicator.